What began last Thursday afternoon as an “Oh my God” when my laptop insisted that my flash drive, containing PowerPoint slides, needed to be formatted, concluded with an encounter with Lee Windhorst who lives very near Lake Ella. He not only wanted a signed copy of The Chetwynd Chronicles that he’d purchased online but had in hand a well-worn booklet containing the abstract of title to (now don’t let your eyes roll) the “East Half of the East Half of the Northwest quarter of the North West quarter of Section Thirty-three, Township Eighteen South of Range Twenty four East,” made for C. L. Adams in 1926. This area contains ~80 acres. Lee also told me that he knows where the Chetwynd Arms Hotel was located. Based on a previous post you can imagine how much that interests me. So in the middle of selling and signing books I glanced through the booklet and noted the name, Morrison, as in William H. Morrison, Stapylton’s first bank partner and the top honcho of the Chetwynd Land Company (west of the town of Chetwynd on Lake Ella) and the Chetwynd Improvement Company (east of Chetwynd). My interest well peaked, I asked if I could borrow the abstract; Lee agreed. Even in a state of near exhaustion, once home I immediately sat down to read the complete abstract and then pulled my file, “The Town of Chetwynd,” to refresh my memory. Granville Stapylton had acquired 160 acres (the west half of the NW quarter, Section 33) from the Tropical Florida Railroad in 1883. A year later, Stapylton’s Subdivision, located in parts of four sections—Section 33 being the southeast portion—was platted into lots. In March of 1885 Stapylton sold over 1500 acres of land, including the acreage in Section 33 (Lots 14-20, 36-39), to his father William for $15,000. Excluded from this sale was Lot 13 that Granville Stapylton sold to William Morrison in May of 1886. In the meantime William Stapylton had sold the remaining lots/land to Morrison. 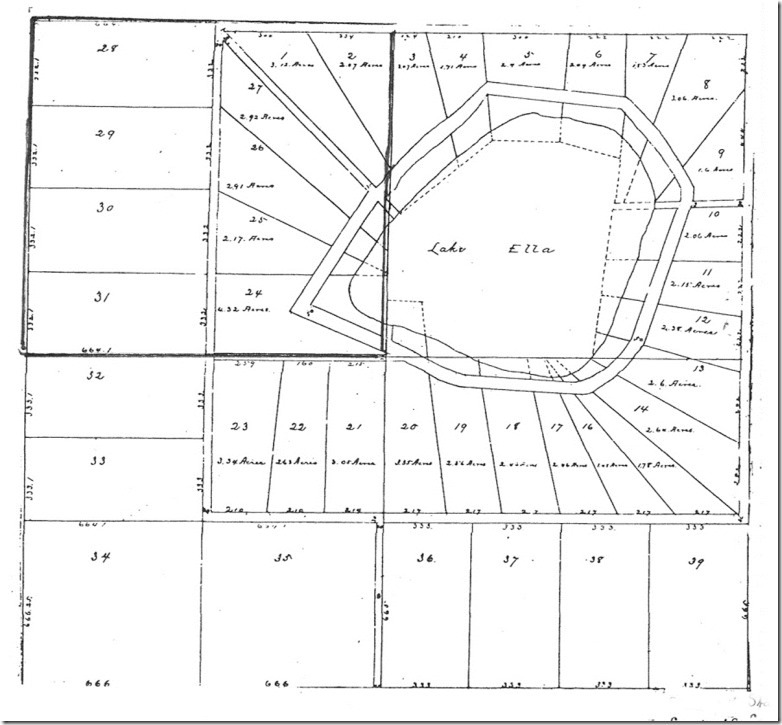 So by 1886 William Morrison owned all of the land in the NW quarter of Section 33 (sold in 1904). To add to his holdings Morrison, according to the abstract, bought 80 more acres in the east quarter of the NW quarter of Section 33 in May 1886. Lee Windhorst’s parents, Fred and Florence, bought 10 acres of this land April 8, 1944. Their son Lee, lives there today. Tomorrow he’s going to show me where the hotel was. I’m betting that Morrison built in along the Lake in the NW quarter of Section 33. Wait and see!